We invite you to Come and Enjoy Thanksgiving 2012 with your Cosmic Family! 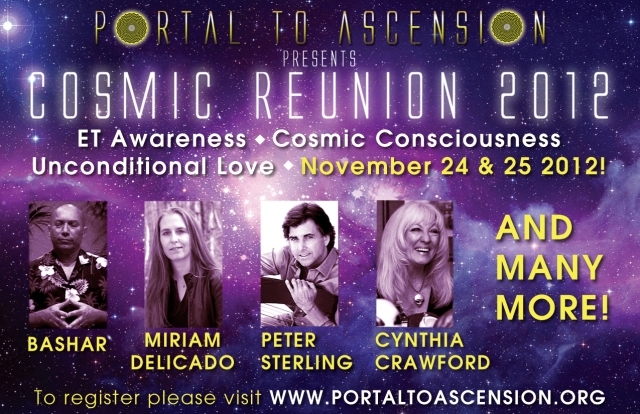 The Cosmic Reunion 2012 Conference has come forth to raise the individual and collective vibration of our planet through the unification of some of the most inspiring figures in the fields of extraterrestrial awareness, cosmic consciousness, and unconditional love. As we awaken to the rememberance that we are an integral part of creation, we allow ourselves to reconnect with our star family and our multi-dimensional selves. Through wisdom and understanding of creation, we can better understand ourselves and our true divine nature. The awareness shared at this gathering is to remind us that we have the power to uplift ourselves and step into our own authenticity.We are in the process of expanding out into the cosmos and this event is a step forward in re-establishing that connection that we have forgotten. When we collectively begin to love and accept ourselves and our brothers and sisters on this planet, we can also accept beings from other worlds as our own family, since we truly are one and come from the same source. We are at a time in history when we are opening up to remembering who we truly are at the deepest levels. With a greater awareness of ourselves, we expand our consciousness and are able to experience reality from a harmonious perspective. Together, we are creating peaceful, loving, and cooperative connections with intergalactic, interuniversal, and interdimensional beings, councils, races, and communities. As a result, we are facilitating a gentle transition into becoming part of a galactic society based on divine principles such as reverance, transparency, and unconditional love. Join us in remembering our connection to our star family, raising our frequency, and expanding our light so that we may usher in a new paradigm of universal love and oneness.